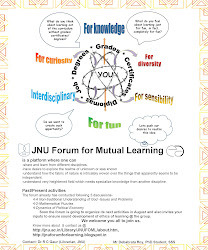 The group is meant for gathering volunteers who are interested in sharing of knowledge with others at JNU. As theatre and performance studies scholar Sudipto Chatterjee would rightly argue in his work The Colonial Staged: Theatre in Colonial Calcutta, the Hindu past both in its historical and mythological dimensions, had become a customary presence in the Bengali theatre of late 19 th and early 20 th Century. Both, the commercial theatre as well as the parallel theatre that existed at elite houses like Jorashanko Thakurbari were drawing on the Hindu past, be it via its historical figures or mythological narratives. This practice was feeding into the conservative Hindu Spiritual­Nationalist project of the period as elaborated by Partha Chatterjee in his The Nation and Its Fragments. In his earlier plays written and performed at Jorashanko, Rabindranath Tagore too, was often found to draw from the reservoir of cultural icons of the Hindu past, un­problematically. However, a distinct change in the nature of his treatment of the past can be perceived in the second set of his plays written after he arrived at Santiniketan. The two phases are separated by a time of ten years (1897­1908) ­ the last play of the first set being Baikunther Khata (1897) and the first play of the second set being Sarodotsav (1908). Sarodotsav written and designed to be performed in form of an Utsav or festive­play is based on a loose quasi­mythical structure. 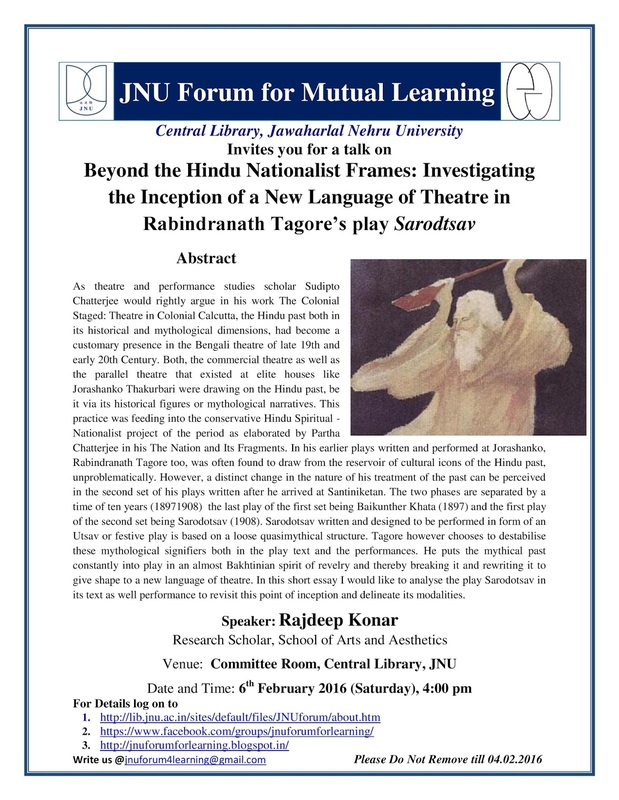 Tagore however chooses to destabilise these mythological signifiers both in the play text and the performances. He puts the mythical past constantly into play in an almost Bakhtinian spirit of revelry and thereby breaking it and rewriting it to give shape to a new language of theatre. 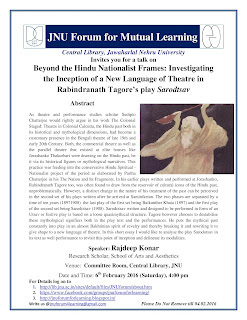 In this short essay I would like to analyse the play Sarodotsav in its text as well performance to revisit this point of inception and delineate its modalities. Diabetes mellitus (DM), also popular with the name sugar, has become a very common disease. According to world health organization 347 million people worldwide have diabetes. Diabetes caused 5.1 million deaths in 2013. In India 62 million individuals have been currently diagnosed with the disease. Diabetes not only affects adults but children and young people are also victims. There are two common types of diabetes mellitus: Type I DM also called as insulin dependent diabetes mellitus and Type II DM also called as non-insulin dependent diabetes mellitus. Not any specific reason but it has been seen that genetic factors along with environmental influences are involved. People with obesity are more vulnerable TypeII DM. Stress, alcohol, tobacco are also risk factors. During this discussion we shall talk about the mechanism of insulin production and its action along with symptoms, diagnostic tests, treatment and preventive measures of the disease. The first ever conference organized by the JNU Forum for Mutual Learning is titled “Harry Potter: Recontextualizing the Magic”. Almost two decades since the publication of Harry Potter and the Philosopher’s Stone, as we begin to gain historical distance, it is now perhaps opportune to begin contextualizing Harry Potter as a popular cultural phenomenon. This conference aims at bringing together a wide spectrum of viewpoints about ways in which this can be achieved, and the methodologies best suited for the purpose. Impediments to this endeavor are plenty, not least among them being the immense popularity of the Harry Potter books and films which forces onto it a timelessness, or at least a classicality which it becomes imperative to deconstruct. The most obvious way to do this, then, would be to look at the ways in which Harry Potter perpetuates popular cultural tropes – evaluating the larger narratives such as those of magic, good and evil and so on vis-à-vis the more particular thematic strains which work in Rowling: like the radicalization of education or the allegorization of British (and European) history. However, it is also crucial, for example, to follow the money, as it were, and examine the ways in which Harry Potter has generated in multiple sectors. It is our objective to create a wide spectrum of positions and opinions and institute a much needed critical reading of Harry Potter, this conference being one of the very first of its kind.